Give a kid a glow stick and you’re giving them hours of fun. Give a kid some glow game ideas, and you can fill their whole summer with nights of laughter and activity. 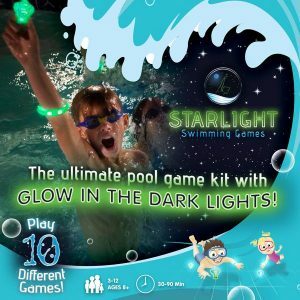 Kids of all ages love glow sticks and playing glow in the dark games. There is something about the bright gleaming colors in contrast with the darkness of night that makes them so exciting to wear and a thrilling accessory for nighttime games. Glow sticks are an inexpensive way to make a summer night, or any night, an extra fun one. 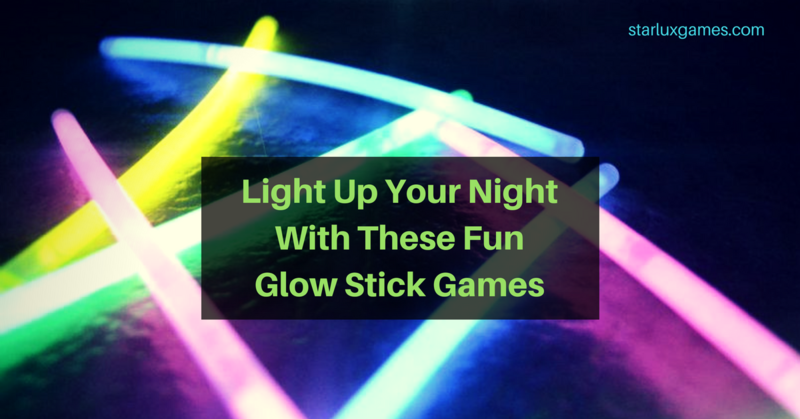 So, buy glow sticks in bulk (you can find them on amazon), turn off the lights and get ready to have fun with these rousing glow stick games that light up the dark. Playing tag in the dark has always been exhilarating. You never know what is hiding in the darkness and when someone will jump out of the shadows. Add some glow sticks and nighttime tag becomes even more futuristic and electrifying. You can use the glow sticks with connectors as bracelets and use specific colors to identify the taggers versus the ones trying not to get tagged. You can also use the big glow sticks with strings that hang around your neck. Kids love treasure hunts and it’s even more fun to hunt for treasure when it’s dark out and the treasure is glowing. Purchase a bundle of different colored glow sticks, activate them and hide them outside at night, or inside in the dark. Then let the hunt begin. When all of the glow sticks have been found, give different glowing prizes to the winners of pre-determined categories such as the most green sticks found, or the one to find the extra long glow stick. It’s a great game for all ages and you can make the hiding places as easy or as hard as you want. Who doesn’t love water balloons? And, when you combine them with glow sticks, you are asking for some crazy, wet fun. Purchase some large water balloons and some smaller glow sticks. Activate the glow sticks and insert one into each balloon. Then, fill the balloons with water, tie them off and place them in large tubs. Get ready for an exciting nighttime water balloon fight, or play water balloon toss in the dark. If you’ve ever played Red Rover, then you can only imagine how much fun it would be to play at night with glow sticks. Two teams line up across from each other on an open playing field with a good distance between them. Everyone on both teams wears a glow stick on their wrists and holds hands to form a chain. Then, one team calls out the name of a person from the opposing team. When the name is called, that person immediately runs toward the opposing side and uses their body to try and break through their chain of arms. Playing in the dark, the glow sticks help the runner pinpoint a target to break through by showing where the linked hands are. If you love strategy, a Tic Tac Glow tournament is a fun way to spend a summer night. Simply activate glow sticks and connect a few to form a large tic-tac-toe board on the ground. Then, use connectors to shape more glow sticks into X’s and some into O’s. Players take turns going head-to-head to place their X’s or O’s just like a normal game of tic-tac-toe. The winner of each round goes against the winner of the next round until you determine a Tic Tac Glow champion. Divide players into two or three teams and give each team a supply of glow stick connectors. Then, activate and hide enough glow sticks for each team to make a rainbow pattern with them. For example, tell the teams that they will need to find one red, one orange, one yellow, one green, one blue and one purple glow stick per team. Someone says, “go” and the teams race to find each of the required glow sticks and connect the different colors in the right pattern. The first team to complete their rainbow wins. Want to add a little creepy thrill into your evening fun? Zombie Glow Stick Tag is an easy way to spook up your nighttime game of tag. Buy twice as many red and green glow sticks and connectors for as many people that will be playing the game. Make bracelets and give the green bracelets to the healthy humans. Choose one person to be the zombie and give them all of the red bracelets to wear on both arms. Tell the zombie to close his or her eyes and count to 40 while the healthy humans run and hide. Then, the zombie goes on the hunt to infect the healthy humans. Once the zombie catches them, the zombie gives them a red glow bracelet to wear and they become a zombie, too. The red glowing zombies keep chasing healthy humans until they are all caught and inflected. The first person to be caught is the zombie for the next round. 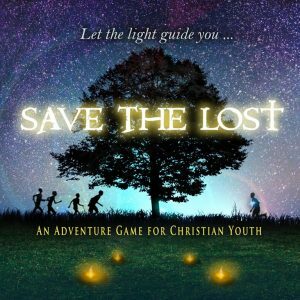 Looking for an inexpensive game to liven up your next nighttime party? Save up ten empty 2-liter bottles and add some glow sticks to create your own glowing lawn bowling alley. Create lanes out of connected glowing sticks and then put a glow stick in each empty 2-liter to make pins. Use a glow-in-the-dark ball to knock down the glowing pins, like the Franklin Sports Glomax Playground ball which is available on amazon. 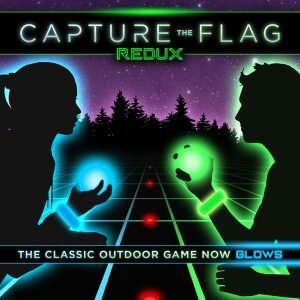 Capture the Flag REDUX is the ultimate in glow technology. 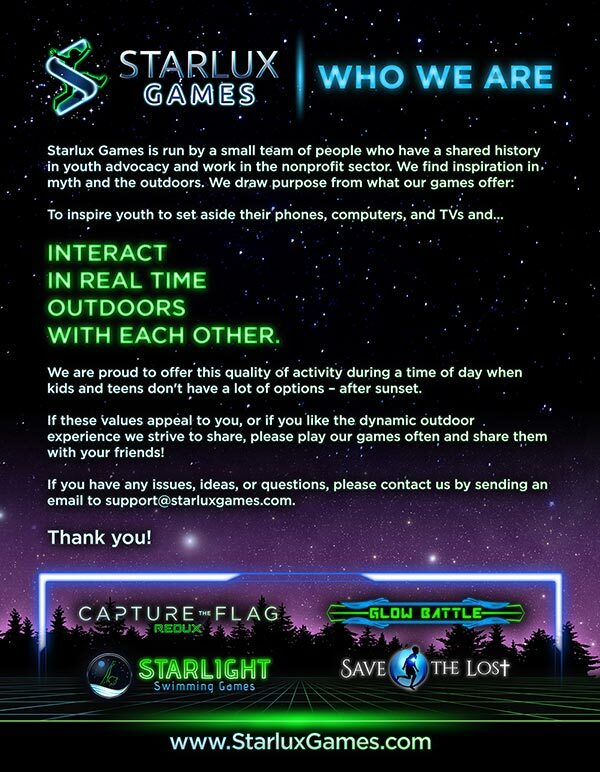 It actually comes with reusable LED glow bracelets in the game, as well as everything else you need to play a fun and futuristic version of the classic Capture the Flag game. It’s the ideal way to get kids, teens and even normally boring adults outside and active at night. It comes complete with glowing orbs to use as “flags,” the color-coded LED bracelets that identify the different teams, and light-up jail markers. Plus, you can purchase the REDUX Expansion Set to get 16 additional glow-in-the-dark bracelets with included batteries that turn on and off for future use. You can use these bracelets to expand your teams for Capture the Flag REDUX, and also use them for any of the above glow stick games. 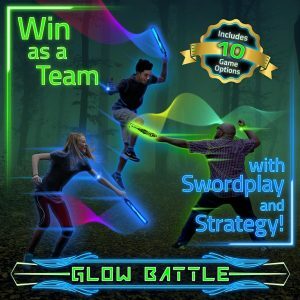 Looking for more exciting Glow in the Dark Games? Check these out! The photo used as the featured image for this post is by Alecia Brown and is available on Flickr.